Happy Stretch Tuesday! It’s BugDoc Dave again! It has been great to see all the incredible iridized glass items over the last three weeks. Since Tim sent in images of his candy jars after I discussed the covered bonbons, I thought that I would cover the “Colonial” candy jars tonight. This is the name that is commonly used by collectors to describe the taller-than-wide candy jars that have panels on the sides. Fenton and Northwood were the major manufacturers of two sizes of these jars – 1/2-pound and 1-pound versions. Most folks miss the fact that Diamond also made two sizes of jars that are very similar but their jars seem to be 1/2 and 3/4-pound jars. I see the Diamond ones listed as “Fenton” all the time on eBay! If you look at the header image, the two jars on the left are the Diamond ones. These have panels with no ribs between them and two distinctive rings just above the panels. These are most commonly found in green and blue, but crystal, pink and marigold examples are known. These have also been seen in the Ruby Lustre and Royal Lustre (shiny silver or gold on red or cobalt blue glass). I have the hope (dream?) of finding one of these in Egyptian Lustre (black glass) or even Wisteria (purple glass). So far, none have come to my attention. 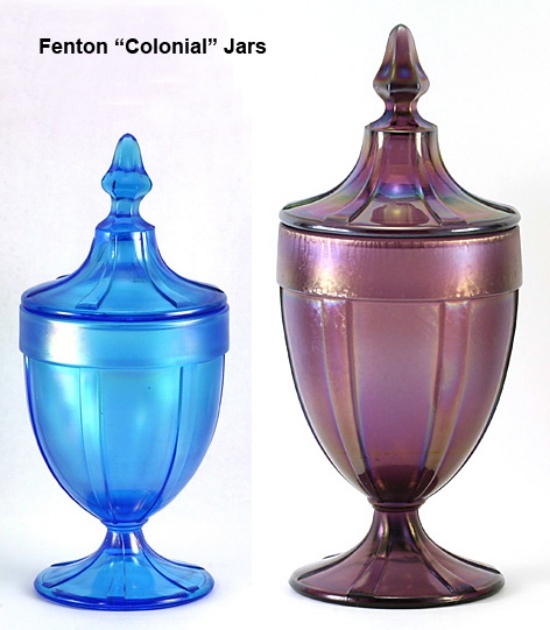 Like the covered bonbons, the Fenton and Northwood Colonial candy jars are nearly identical. In fact, both companies used #636 to describe their 1-pound versions!! These #636 jars are very difficult to separate unless they have lids. 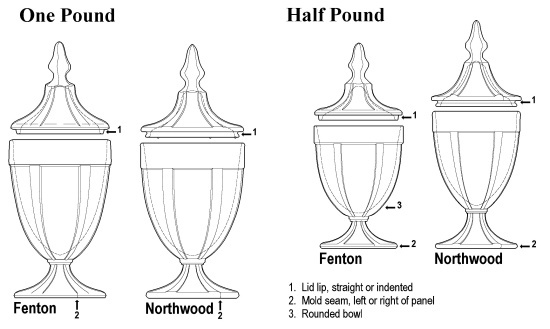 The Fenton’s lid has a straight lip that fits inside the base (same as the covered bonbon) but the Northwood lip has an indentation (also like their bonbon). If you only have the base, you will have to look at the foot where the raised rays meet the rim. If the mold seam is on the left (as you look at the jar sitting on a surface) it is Fenton. If the mold seam is on the right of the ray, it is Northwood! The ½-pound Fenton jar is #635 while the ½-pound Northwood jar is #659. To my eye, the base of the Fenton jar is very rounded while the Northwood jar is more tapered. If they have lids, the straight lip and indented lips are diagnostic features. Otherwise, the seam locations can be used. 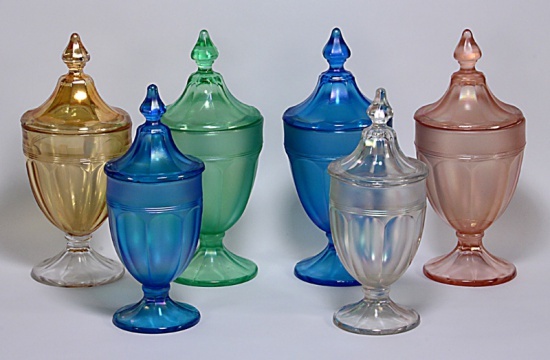 The Fenton jars come in the common Fenton colors (i.e., Florentine Green, Celeste Blue, Topaz, Wistaria, and Grecian Gold) with Tangerine, Velva Rose, Persian Pearl and Aquamarine being tougher to find items. I have hopes of finding one in Ruby or Royal Blue, but none have shown up yet. 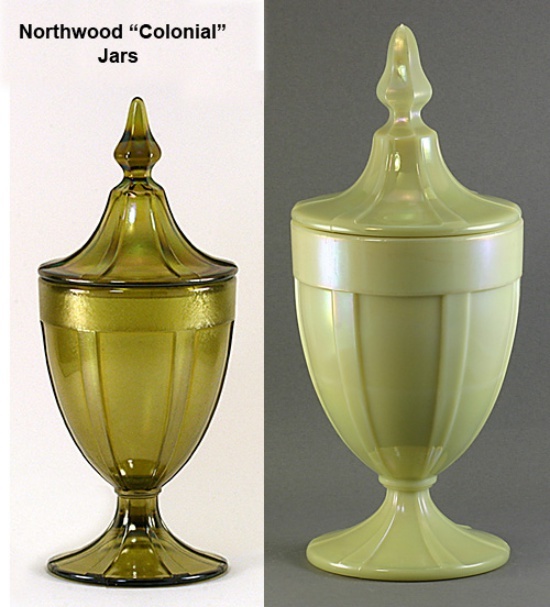 The Northwood jars are most commonly found in Blue, Topaz, Russet, Jade Blue and marigold. There are custard ones and one opaque white jar known.